Have you ever sat down to Thanksgiving dinner wondering if there was someone coming who you didn’t know about? Because from the amount of food on this table, you could probably feed another half dozen people. This delicious dish is made of seared scallops and Thanksgiving leftovers. But that’s okay because…. Leftovers. Right? Who doesn’t love that sandwich at 10 pm on Thanksgiving night or the yams you’re still eating into the middle of December? We certainly do. But the same tired leftovers over and over again get old. How many times can you break out that foil covered bird from the fridge? So after T-Day, why not use those leftovers to create something that rivals the original meal? This month, we got up with Chef Kyle Baddorf, chef at Parker’s Garage, right down the street from the Whale. Kyle got creative and showed us some ways to take those Thanksgiving leftovers and mix them with some local seafood for a fantastic second time around with some accents of the LBI Region. After all, this is a four-day holiday and chances are, you’ll be cooking with family or friends again before work starts on Monday. Chef Kyle can make leftovers better than the original. Photo: Ann Coen. The puree is made by cooking down squash, garlic, onions and stock and blending until smooth. Once plated, it might look better than the original meal. The holiday addition to this plate is the turkey skin. “After Thanksgiving dinner, leave the turkey skin in your oven over night to dry it out. You can break it into different pieces of the sizes you want. And then you’re just going to deep fry them,” Chef Kyle explains. 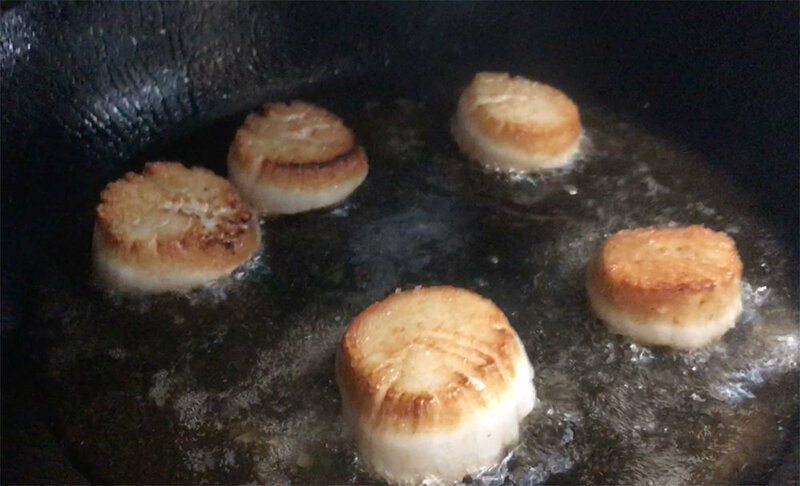 Scallops are the one seafood that we get consistently locally caught for at all of our restaurants. They can always be bought fresh because they come into Barnegat Light year round. And they’re a nice switch after the turkey. Figure on about five scallops per person. It’s going to taste good no matter what, but Chef Kyle likes to plate it nice. It’s a fantastic way to rethink your leftovers. The Tide Table Restaurant Group would like to wish everyone a very happy Thanksgiving. We have so much to be grateful for.